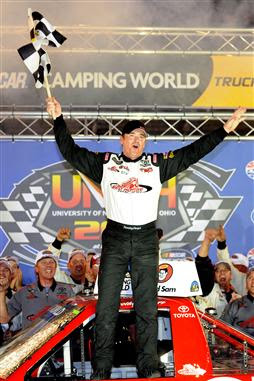 Timothy Peters flexed his Red Horse Racing muscle at Bristol Motor Speedway Wednesday night, leading all 204 laps of the UNOH 200. With new teammate Parker Kligerman finishing second, owner Tom DeLoach got a 1-2 finish for his birthday. Ross Chastain nabbed a career-best third, the first top-five finish of his young career. Any uncertainty about the racing surface evaporated when Peters took the lead into the first corner and not long after that, the field went three-wide on a track that used to be known for a narrow groove. The first 82 laps ran caution-free. According to the announcers on SPEED, that constituted the longest green-flag start to the race since June 2005 at Milwaukee. In all, six cautions slowed the race for a total of 43 laps, including Peters and Kligerman's RHR teammate Todd Bodine who cut a tire down when polesitter Cale Gale got into him on Lap 160. Gale went out on Lap 195 in a tangle with Joey Coulter and Ross Chastain. Coulter and Chastain continued, with Coulter finishing in fourth and Brendan Gaughan rounding out the top five. Ryan Blaney finished sixth in his Truck debut. Though Peters led the whole race, he did face serious challenges by Brad Keselowski, who had some difficulties on restarts, including the final one when he ran out of fuel and had to pull off the track. Ty Dillon's tank also ran dry on the G-W-C restart, the field splitting around him but with no caution, the race ended with no further incident. Dillon's ill fortune cost him in the points standings, though. Peters now has a 17 point lead over second-place James Buescher and 25 points over Dillon. Navigate over here if you want to know more about Instagram hacking.